Where Will Your Function Be Held? We've made selecting a mobile DJ for your Karaoke Party easy. All our members have £10m Public Liability Insurance for your peace of mind should the unthinkable happen. Our members also adhere to a code of conduct towards their clients and have the support of AMPdj. AMPdj and AMPuk are trading names of AMPuk Members Ltd (Company Number NI611966) Registered in the UK. Registered address: AMP House, 50 Moneyduff Road, Cloughmills, BT44 9NY. 3 - Tell us a few details about your party. A Karaoke evening or a disco which includes Karaoke can create a lively, fun party where you and your guests are the stars! Click the map (right) or the links below it to select your area/County. Then tell us a few details about your party and the type of entertainment you are looking for... In just a few hours you will receive replies from mobile DJs and KJs in your area who are available for your date and can meet your requirements. You can then study these at your leisure, compare the options and, most importantly, you decide. You have total control - you don't have to register to make your enquiry and the choice is yours. This is a free client service designed to make selecting mobile disco and karaoke entertainment for your celebration easy, fast and straightforward. Use the map above or the links (top) to select your area. 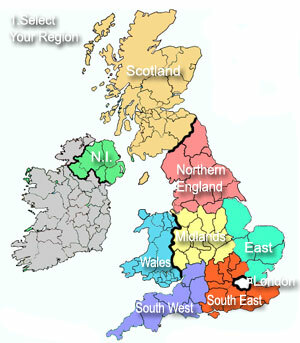 On the next page refine your choice by clicking your county or area. Complete the short enquiry form and mobile discos and karaoke DJs for hire in your area will contact you directly with price quotes.